We know that housing prices in D.C. are on the rise — the District is the only major city that saw an increase in home prices in the past year. But our housing prices haven’t really dropped all that much from the peak of the housing bubble, either. Real estate website Zillow and Wall Street Journal have mapped the drop in home prices in six major metro areas since the height of the housing bubble. The big takeaway for D.C. is that in nearly all D.C. zip codes, home prices haven’t severely plummeted since the height of the bubble; in some neighborhoods, such as Dupont Circle, they’ve dropped by only 4 percent. The only zip codes with housing drops below the metro average were in 20024 — which includes the Southwest Waterfront — and 20032, in Ward 8. There is also a huge east-west divide in the region; the suburbs to the east in Prince George’s County experienced the most severe post-bubble drops in areas abutting the District. And those suburbs are home to many residents who left D.C.’s Wards 7 and 8. 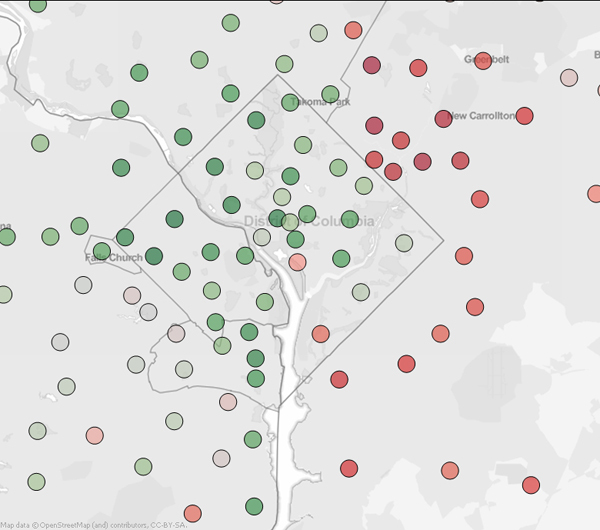 Green dots show housing price declines from the peak of the market that are above the metro average; red dots show declines below the metro average.